Well, it's that time of year again, when the streets are filled with slippery leaf muck & the weather starts to fit the nickname "Raincouver" around here. & when the salmon fight their way upstream to spawn in the gravel of shallow creek beds. We got to see some of those salmon up close (well, sorta close) Tuesday, in Still Creek. 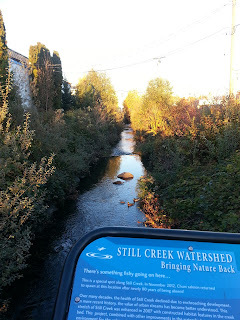 One of only TWO remaining streams in the City of Vancouver, Still Creek was reduced to a polluted mess, buried under roads along about two thirds of its 17km length, lacking in natural vegetation to provide animal habitat on its banks, & constricted into sterile concrete channels. Needless to say, it was uninhabitable to the salmon, so they stopped returning. In 2007, the city embarked on a restoration project of parts of Still Creek, reducing concrete at the edges of the stream, & replacing invasive species with native plants along the banks. Five years later, the chum salmon returned to the creek to spawn. They've come every year since. Linnaeus & I visited the stream last year. There's a spot around 3400 Cornett Road, just north of the Canadian Tire Grandview, where you can walk onto a wooden bridge over the stream & watch the battle worn fish struggling their way past the rocks in the creek. I can't remember how many fish we saw, but it was only a few. 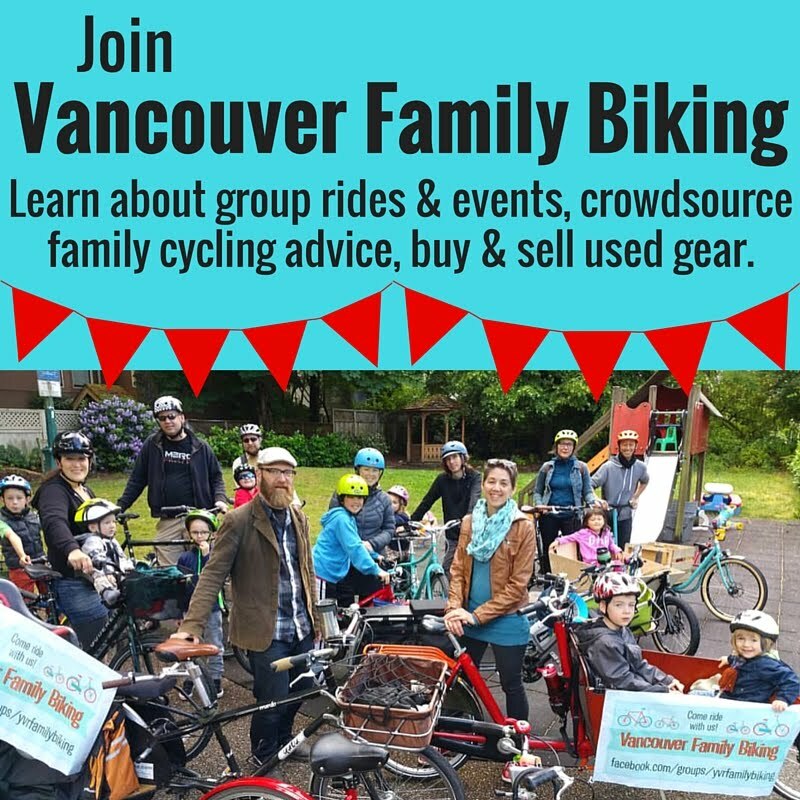 This year, I put the word out & some friends from Vancouver Family Biking joined us along our ride from Linnaeus' school all the way over to the easternmost part of Vancouver to see the salmon. Mike & his daughter rode their Surly Big Dummy from the West Side to meet us a few blocks into our sunny ride, then the six of us rode eastward to meet Melissa & her two girls at their school. 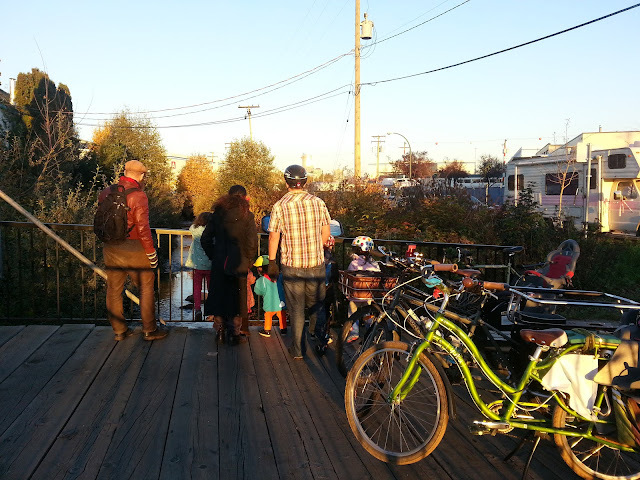 She got her kids onto their Yuba El Boda Boda & we all joined bike rush hour along the Central Valley Greenway. 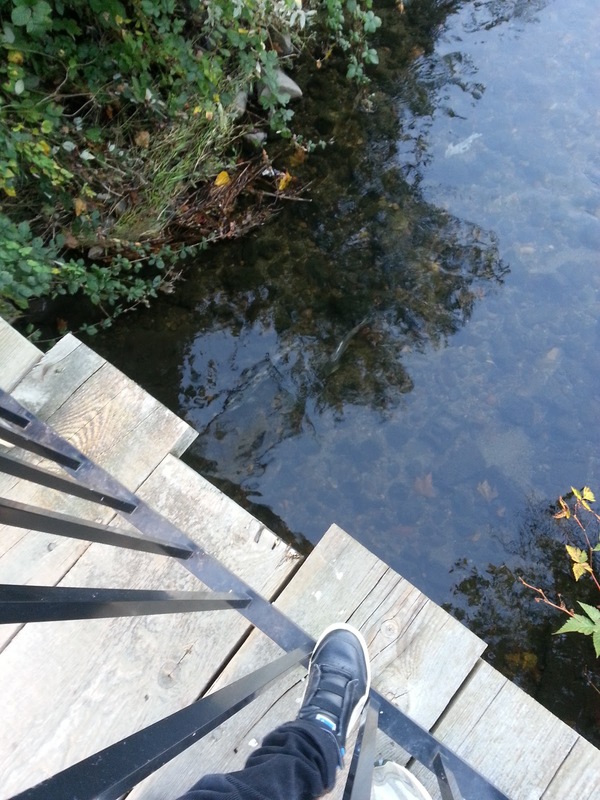 We soon arrived at the spot, parked our bikes on the wooden bridge & spotted some salmon, ducks, & even a heron down in the water. We had about an hour before dusk, enough light to see a few salmon splashing their way upstream under our feet. The kids watched the fish, played, & snacked while the adults took far too many photos & videos with our smartphones. Interestingly, while we were there several other people came to see the fish, all of them on bicycles. I think they may have been on their way home from work. It's one of the things I love about biking for transportation--it's just so easy to take little detours or stop for things spontaneously like this. I'm not sure how long the salmon will be around in Still Creek this year, but if you have the chance to get over there in the next few days, you should go! It's really a neat experience to see them.